We are excited that our hives and beekeeping equipment are in such demand! Wow, and what excites us even more is that many of our new customers are new to beekeeping! Honeybees are going to make a come back as more and more people begin to keep bees!! Several of you have been sharing this blog with others...THANK YOU!! And, others have been sharing our prices with others, and sending more customers our way...THANK YOU!! Today, my father-in-law broke his morning record and built 42 deep and medium supers. He hammered 1004 nails! Sheri and I are ordinary folks, who started keeping bees as a hobby and eventually found it to be so enjoyable and rewarding that it turned into a business. However, to be honest with you, we are a mom and pop operation. So when you call in, you're either get mom or pop! We'll treat you like family and do our best to answer your questions and help you any way we can. If you ever stop by, you'll find me in a flannel shirt with old blue jeans spotted with wood glue and paint. We're just hard working folks. And we appreciate your business. Although we are always learning more and more about beekeeping, we've learned a lot over the years. So, these lessons are FREE, a gift from us to you, so that you can avoid the mistakes that we made, and hopefully get off to a much easier start keeping bees. Back in 1994 when I started my first honeybee hive, I didn't know what I was doing and had no one to talk to much about it. I was lost and made huge mistakes. So, you've got a friend in us! In today's lesson, we want to give you a yearly calendar of what we think you should be doing as a beekeeper each month and a summary of what your bees are doing. This may vary slightly due to the variation in climates, but you can make the adjustments accordingly. JANUARY AND THE BEES: The bees are in a tight cluster staying warm and consuming very little food. On days when the wind is calm and the temperature rises above 40, you'll probably see a few bees flying out taking a cleansing flight. Since bees do not go to the bathroom inside their hive, they fly out on warm days and this is called a cleansing flight. Winter bees live a little longer than summer bees, but remember, bees live short lives. Many of your bees will die during the winter, just from old age. When bees die during the winter, they fall to the bottom of the hive. In the summer, die bees are immediately carried outside the hive by their sisters. But, in the winter, when the hive is clustered, the dead bees accumulate on the bottom board. On warm days, other bees might try and drag out their dead sisters. When snow covers the ground, you will noticed more dead bees around your hives. This is normal. Don't panic! It is a sign of a strong hive when they drags out dead bees. But, if you don't see anything don't panic either. It just means they will probably do this later on. JANUARY AND THE BEEKEEPER: Monitor your hives to make sure winter winds have not disturbed the tops. Also, make sure that after it snows, that the openings are cleared of snow so that the bees can continue to get enough air, and move freely in and out of the entrance on warm days. Many bees suppliers will completely sell out of package bees by the end of January. You must call and place your bee order as soon as you can during the first week of January. Otherwise, you may not be able to secure your bee purchases for the 2008 year. Those of you who will be ordering your bees from us, Long Lane Honey Bee Farms, we will be prepared to take your orders for package bees and nucs beginning on Wednesday January 2nd and everyday thereafter until we run out. Call early! FEBRUARY AND THE BEES: Sunlight is becoming slightly longer and a few more warm days triggers the queen to start laying a few more eggs. Their cluster has worked its way upward into the top deep brood chamber. They are basically behaving the same as it January. FEBRUARY AND THE BEEKEEPER: On a warm day, 50 degrees or more, you can open the top briefly and look in on the hive. Do not remove any frames, as this will chill the bees and the brood. Upon inspection you can assess if the colony still has enough stored honey for food. If not, you may want to consider emergency feeding options. Emergency feeding is just that...an emergency. So do whatever it takes to get some sugar in the hive. Dry sugar will work but only if the bees have warm enough days to fly out for water. There may not be many days warm enough in northern states for dry sugar feedings or hard candy feedings. Sometimes I have soaked sponges in heavy sugar water and jammed the sponge between the frames near the cluster. You can also place a plastic zip-lock bag full of sugar water directly over the cluster and poke a few holes on the top of the bag or make a slit in the bag. Do anything you can think of...after all it is better than letting the hive starve to death. Of course, if you have frames of honey available, that's the best way to feed them, but most of us have sold all our honey by now. You might also consider placing a pollen patty on top of the upper deep box. This will really work well if the end of winter is extremely mild and there are many warm days. Pollen patties stimulate the laying of more eggs. However, if the weather turns cold again, then the bees may not be able to keep this early brood warm and fed. So it is a gamble this early for northern states. Finally, if you did not order your package bees in January, you must do it now! And if you did not order your new equipment, hurry! You want all of your hive equipment ready by March. MARCH AND THE BEES: If the hive was low on honey going into winter, then March is the month they may starve out. They have probably moved all the way up in the hive and their overall population is very low due to normal die-outs throughout the winter. The bees are going to be flying more in March, and they will find pollen even in northern states. The queen will start laying much more in March. The entire hive will begin to return to an almost normal operation now that winter is almost over. There will be cold snaps, but the bees will do fine as they begin to expand. MARCH AND THE BEEKEEPER: Continue emergency feeding if needed, and place entrance or top feeders on the hive and feed 1:1 sugar water, one part sugar and one part water. Continue with the pollen patty feedings. Inspect your hive! March will provide you with a few days when the temperature will rise to 50 degrees or higher. At this temperature you can look in the hive and pull out a few frames. Keep in mind that since there is not a heavy nectar flow, and since it is cooler, the bees might be a bit more aggressive. I am stung more during these cold inspections than the rest of the year. So wear protective gear. March is a great month to start feeding the pollen patties. If you don't make your own patties, we sell the pre-made pollen patties which can be placed right in the hive. Pollen patties truly do jump start the hive. I highly recommend that you place a pollen patties in your hives in March. The bottom board will probably be filled with dead, winter bees. They did their job, so play "Taps", salute them, and toss them in the yard for the mice and birds to enjoy. Serve your mice an eviction notice. You'll be able to assess how many of your colonies have died out over the winter. Clean out these boxes and freeze the comb if you can. This will prevent the spread of wax moths. This link provides information on how to freeze your combs and for how long. March is our busiest month in hive equipment and bee sales. Everyone calls and wants their hive yesterday! Please do us a big favor and order your hives in January. APRIL AND THE BEES: Now the bees are almost fully operational. There will still be a few cold snaps, especially in early April, but by the last two weeks, the weather is good for bees to rapidly expand and to even start bringing in more and more nectar and pollen. The queen is laying well now. The hive is expanding. APRIL AND THE BEEKEEPING: Keep feeding! Feeding helps the bees build up. No supers are on your hive yet, so their intake of sugar is not going into your honey product. You are just feeding to help the hive off to a great start. Keep the pollen patties on top too. Remove entrance reducers. April can be cold and wet which means that your bees may have limited opportunities to fly out for food. So you must continue to inspect the hive to be sure they have enough food stores. Also, inspect your hive for any abnormalities. You want to see a solid brood laying pattern from your queen. If not, consider replacing her now! Reverse your brood chambers! This is extremely important as it gives more space for the queen to lay. Simply take the top deep brood chamber and place it on the bottom board and place the one that was on the bottom on top. If your bees are no longer taking the sugar feeding, discontinue, put supers on, as the bees will now begin to collect dandelion nectar and nectar from Maple trees, Locust trees and other early Spring flowering plants and trees. This is a great time to equalize your hives. You may have to combine weak hives with strong ones. Even though I know better, every year I seem to become too compassionate toward a struggling hive, and try to nurse them back to health. Last year, I successfully did just that with one hive, but another hive bit the dust in September after I nursed them along all year. It is usually not worth it. It is costly to spend too much time on a struggling hive. It takes money and time to requeen the hive and to continue to work it. It would be far better to combine it to another hive if it is disease and pest free. After all, a weak hive is an invitation for pests and disease. Strong hives chase away pests and disease. So, your weak hive could spread disease to all your other hives. Don't take the chance. Keep your hives strong. MAY AND THE BEES: Bees are in full operation now that it is May. You can stop feeding strong hives now because they are bringing in lots of nectar and pollen. The hive is expanding rapidly. The brood chambers are filling up fast and becoming crowded and congested. MAY AND THE BEEKEEPER: RED ALERT!! BEES SWARM IN MAYYou will have to implement a swarm control strategy. Keep in mind that bees swarm as a way of multiplying. It is not a sign of being a poor beekeeper. However, there are some important steps to implement to try to prevent swarming. Review the link above. Keep in mind that you must provide room for your hive to expand. And, you should put on honey supers in May. Put on as many as you'd like. I think it is good practice to have a minimum of two honey supers on all hives during the nectar season. Three or four supers are even better. Don't wait to add your supers or you may miss particular nectar flows. Get all supers on by May 1st! Consider having an extra, empty hive on hand so you'll be able to capture a swarm. You will want to capture your own swarms or you will probably receive phone calls once your neighbors learn you are a beekeeper. We receive several calls each week all Spring and Summer. JUNE AND THE BEES: The bees will be working hard filling supers. They can still swarm during June, so keep an eye out for swarms. There is no need to feed the bees. They are gathering plenty of nectar and pollen. You may see the bees hanging out on the front of the hive at night. This is normal. On hot and especially humid evenings, many bees will spend the night outside the hive, clinging to the front of the hive or they may form a beard on the ground in front of the hive. This phenomenon is called "bearding". This would be like you enjoying your cool porch on a hot evening. Continue to monitor your hive. We suggest inspecting your hive every two weeks to ensure the queen is laying well. The bees will need water, so be sure to keep a water source near your hives. We fill bird baths with water so that our bees stay out of our dog's water bowl and our neighbor's pool. Most beekeepers begin to consider the amount of mites within hives during June. Some even begin to treat. However, no treatments can be administered in a hive while supers are on. This could contaminate the honey with chemical residue. We do not use chemicals in our hives but we do treat for mites with powder sugar. However, we wait until the last summer nectar flow is over before treating with powder sugar. For Central Illinois, the summer nectar flow ends about the first week of August. If mites become a problem it will be during the summer and fall months. We do not like to disturb our bees during Summer nectar flows, nor do we want any traces of powder sugar to be added to the honey. So we wait until August or September to begin our powder sugar treatment program. JULY AND THE BEES: The bees are behaving as they did in June. JULY AND THE BEEKEEPER: Continue to check your supers! You'll now be removing and extracting your honey. AUGUST AND THE BEES : Since the nectar flow will end this month, the bees will become much more flighty, searching for nectar which is now not as plentiful to find. The bees are making a final effort to store up for winter, searching for final nectar sources. Golden rod and Aster plants can provide an average nectar flow in the fall. AUGUST AND THE BEEKEEPER: If you have multiple hives, you must be careful not to let a strong hive rob a weak hive. If nectar is still coming in, continue to place supers on the hive. Be careful not to open up the hive for extended periods as other hives may try and rob the hive while it is opened. I usually will place a 5 gallon bucket in my bee yards and fill it with 2:1 sugar water, 2 parts sugar and 1 part water. Then, I will fill it with clean sticks so the bees will not drown. After a few hours the bucket will be covered with thousands of bees. Don't put this close to your house. This is a great way to fed your bees and to prevent them from robbing other weaker hives. If you have just one or two hives, this will not be necessary. SEPTEMBER AND THE BEES : The bees will still be working fall flowers but in most states, the amount of honey produced in September will be minimum. The days are still warm enough to allow the bees time to gather more last minute nectar prior to the first major hard freeze or frost which will kill the flowers. 1) Consider requeening. You don't have to, if your queen has done well. But it is advisable to requeen in September. If you can afford to requeen your hive each year, it would be best to do so in September. A new queen means a much younger queen who has stronger pheromones and who will be more apt to lay eggs more efficiently in the Spring. In a future lesson I'll teach on how to requeen a hive. 2) Take off all your supers. There is no need for them now, and you will want to tighten up the hive by removing excess supers. 3) Weigh your hives. This is guess work unless you invest in a hive scale. Find something around the house that weighs around 70 pounds. Lift it up slightly with one hand. This will give you an idea what 70 pounds feels like. Now, go to your hives and with one hand, slightly lift the back. Only lift it an inch or two so that you can sense how heavy it feels. It needs to feel around 70 pounds. If not, you will want to start feeding the hive 2:1 sugar water. Because robbing is a problem this time of the year, here's what I suggest. But first let me discuss my experience with feeders. My favorite feeder is the front feeder, the one that slips into the front of the hive opening at the bottom and a mason jar slips down into it. However, in the fall, bees from other hives can make their way to the front feeder, and eventually rob the hive. So I do not use this entrance feeders during the fall. By the way, this is called a Boardman feeder. Top feeders are large resivors of sugar water above the hive, usually made of plastic and they have a small space where the bees can climb into a screened area and go down into the resivor to consume sugar water. Here's what I don't like about that. If the top cover does not cover it well, bees from other hives make their way into the top of the feeder and drown or rob the hive. If you make the top cover fit tight enough to keep robbing bees out, then the sugar water cab mildew and mold. And, once I had a top feeder break and leak 2 gallons of sugar water onto my hive, drowning and disrupting the hive for several days. There are some nice top feeders available, but I don't like to use top feeders. Frame feeders are feeders that slip in between your frames, and actually take the place of a frame. Essentially it is a thin bucket that is about the size of a frame and the bees can eat from within their hive. These require going deep into the hive to load and they aren't perfect either. So, what you should do duirng September is purchase our fall feeder system. Or you can make your own. Our system resembles a brood chamber size super but with a bottom. A round hole with a mason lid is placed in the bottom of the feeder. Now, you place your mason jar in the lid and place your inner cover and top cover on this feeder. These work great and the feeder winds up being right over the cluster, so you can even feed the bees long into the winter if needed. Also, stay out of your hive as soon as you finish your hive work. Propolis is the glue that holds all the pieces of the hive together. Every time you open your hive, you break the propolis seal. If you do this late in the year, when warm days are over the propolis will never seal again, and your hives can be blown a part in the winter by bad winds. So plan to get out of your hives early enough so the proplois can reseal on a warm day. OCTOBER AND THE BEES: There are less reasons for the bees to leave the hive. Flying is cut way down. The queen is laying very few eggs. They are now shifting to winter mode. OCTOBER AND THE BEEKEEPER: Prepare your hives for winter. A wind break should be considered. Entrance cleats should be placed in the front opening to restrict mice from entering the hive. A word about bees and winter. A large hive will not die from cold weather. They stay warm by clustering in the hive. They keep each other warm. The temperature in the hive is only warm within the cluster. They do not warm the entire inside of their hive, only the cluster. They can survive extreme cold weather. But, moisture can develop within the hive as bees do give off moisture like we do. If this moisture gathers above them, it can drip onto the cluster. This is what can kill bees during the winter. They are much like us. We can be cold and get by. But, we cannot stay alive long if we become wet and cold. Bees can get wet in the summer and it is not a problem. But you must prevent your hive from becoming cold and wet from condesation developing within the hive. Here's how we do it. We use screen bottom boards, fully opened. We do not restrict or cover our bottom boards for winter. Nor do we place any gaps near the top cover. The open screen bottom board allows enough ventilation within the hive to aleviate moisture build up. We do not wrap for winter, although many do. It has been shown to slightly help. Black roofing paper works great. We have too many hives to wrap. Keep in mind that by wrapping your hive, you might be increasing the chance for condensation to collect within the hive. Winter winds can be strong, so place a heavy concrete blocks on your hives. NOVEMBER AND THE BEES: The bees continue to cluster for winter. They may not yet go into a full winter cluster, and may actually develop two clusters. They may break cluster frequently on warm days and recluster at night. But they will begin to cluster for the winter. NOVEMBER AND THE BEEKEEPER: Feed your light hives as long as the sugar water doesn't freeze. Finish up all winterization of your hives. On a cold day when the bees are all inside, weed-eat around your hives. Enjoy Thanksgiving! Start purchasing next year's equipment. DECEMBER AND THE BEES : The bees are happily clustered in the hive keeping warm having fond memories of how well you took care of them during the season. They will only leave the hive to take cleansing flights on warm, sunny days. 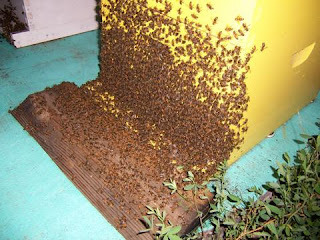 Naturally dieing bees will pile up at the door of your hive or in front of the hive if it warms up enough for other living bees to carry them outside. DECEMBER AND THE BEEKEEPER: Relax and review our bee lessons for Spring! Order your equipment so that you can have it ready. Enjoy celebrating Christmas. Stay warm and keep the snow away from your hive entrance. Consider expanding your apiary. Thanks again, everyone, for your compliments and phone calls about these beekeeping lessons. It's great to talk with you and we do appreciate your business! Even our youngest son and sixth child sends his greeting to you too! 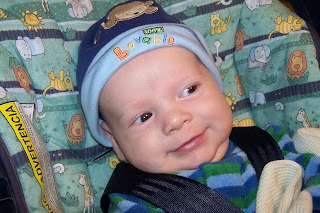 His name is Christian, and he was born September 13 and weighed 10 lbs and 1 oz. Be sure and give us a call to order your bees and hive equipment. We'll help you get set up to keep bees, even if you don't have the slightest idea on what to do. That's why we are here. Our number is: 217-427-2678 or visit our website at: honeybeesonline.com. In our next lesson, we'll look at how to requeen the hive. I'm in Tuscaloosa, Alabama. How much does this change the calendar? From what local beekeepers in Alabama tell me, there is a city ordinance banning beekeeping in the Tuscaloosa city limits...so I'm hoping your hives are well hidden. I live in California and have two very nice thriving hives. Both supers are 98% capped and almost ready for harvesting. They are filling two more, aprox. 40% of uncapped liquid at this writing. Should I harvest the first two when all are capped and leave the rest thru the winter, or should I harvest again in October. Our winters are mild and do not change until the 3rd week of October. I dont want to be greedy, i am just too new to know what is proper. With it nearing the beginning of June and warmer nights now, would it be safe to remove feeding jars, pollen patties and the entrance reducer for package bees I installed a month ago?